A rather quiet Whitby took place earlier this month, but still was good fun for all those who attended. Many of the present day difficulties faced by traders and punters alike is the recent division between the events, amounting to 4 events a year instead of two. Some of the original synergy has been lost and I feel many punters stayed away altogether. Most traders cant afford the time to attend both events and I felt compelled to choose a side of the divide to trade at without really knowing either of the promoters or the specific issues resulting in the split. That being said, thanks again to the stoic Whitby crowd and the glorious individualism shown yet again in the fantastic range of costuming and general sense of fun. So..our next event is taking place in our home town of York. The DV8 festival is in its 3rd year http://www.dv8fest.com/ and is one of the finest alternative music festivals in the UK. usic and events will be taking place throughout the daytime and evenings of the city on 21st – 24th July 2011. 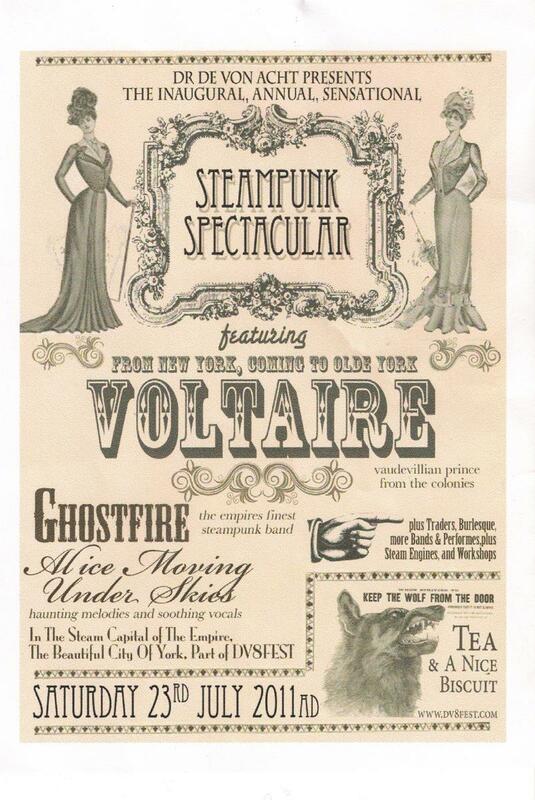 Saturday 23rd July is the Steampunk Spectacular within the festival and will take place in and around ‘Stereo’ http://www.stereoyork.co.uk/, one of York’s finest alternative music venues. We will be trading alongside Dr. Geof http://www.islandofdoctorgeof.co.uk/and the First Tea Company. Clockwork Zeppelin will be bringing along our patented ‘Cameotogram’ studio (see earlier posts around Maker Faire) and as usual thrusting our usual mixed bag of ephemera and baublery on the unsuspecting public. We may have a large collection of scale model live steam engines provided by one Baron Von. Dawson of Flugloft Holgate – yet to be confirmed. Many more traders expected in addition. More news on the run up to the event and dont forget to browse our (mostly) fully functional web shop www.clockworkzeppelin.co.uk. This entry was posted on April 23, 2011 at 12:27 pm and is filed under Uncategorized. You can follow any responses to this entry through the RSS 2.0 feed. You can leave a response, or trackback from your own site.